Tim Anderson studies American literature and culture, with an emphasis on the poetics and aesthetics of historiographic epistemologies. His current research considers the resonances of both seventeenth-century history and twentieth-century poetry in the theoretical bases of minimalist art. 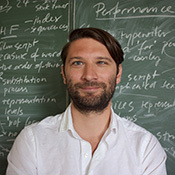 A doctoral candidate at New York University, he holds degrees from Harvard College and the New School for Social Research, and also has studied at the University of St Andrews and Central European University, Budapest. He has taught courses in English at NYU, Humanities and Social Sciences at The Cooper Union, and American Studies at Pace University.